A trip to Mumbai is never complete without indulging in food. I have a thing for deserts. [Actually, I have a thing for all things food ;)] This particular day after having a wonderful meal at Caravan Serai at Bandra West, Mumbai with my colleagues, we decided to cross the road and walk over to one of my favorite desert joints Chocolateria San Churro. The one thing you *have* to have at San Chrurro Chocolateria is Churros. Churros are normally referred to as Spanish Doughnuts. Essentially there are a fried dough pastry ala choux served with your choice of chocolate dips. The one I’m talking about is called Churros Medio. 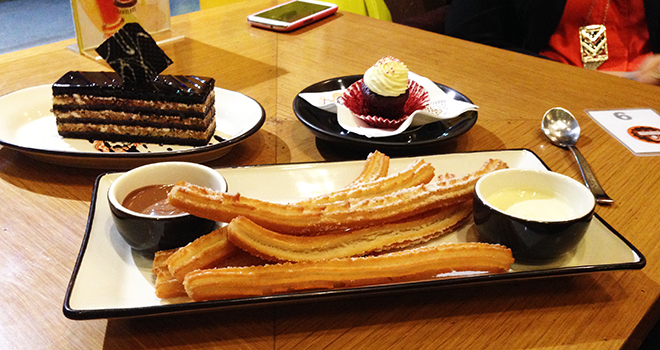 Churros Medio serves six pieces of churros along with two melted chocolate pots – milk chocolate and white chocolate.